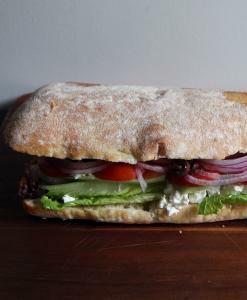 Crisp and flavorful Greek salad stuffed into chewy ciabatta bread is an easy, filling meal when you want to feed a crowd. This version is vegetarian, but meat lovers can add thinly sliced hard salami. Artisan bread is important here. Thin-crusted ciabatta has a coarse, open crumb that will soak up the olive oil and lemon juice sprinkled on it. Begin by slicing the bread horizontally (as if the bread were the world and you were cutting through the equator). Add lettuce, roasted tomatoes (or fresh, if you prefer), cucumbers, briny black olives, and soft, creamy feta, such as the French variety. Reassemble the bread and slice into sandwiches for stacking on a platter or wrapping individually. Then pack in a cooler, head to the park, and picnic like kings. 1. Set oven at 400 degrees. In baking dish, place the tomatoes cut sides up. Sprinkle with olive oil, salt, pepper, and oregano or thyme. 2. Roast for 1 hour or until the tomatoes are very soft. 1. In small bowl, combine olive oil and lemon juice. 2. On a cutting board, halve the bread horizontally. Set the bread cut sides up. Brush the cut sides of the bread with olive oil and lemon juice. 3. Arrange romaine leaves on the bottom slice. Top with feta, and set the cucumber on top in overlapping rows. Add the roasted tomatoes, onion, and olives. Sprinkle with oregano and pepper. 4. Set the top slice on the sandwich, pressing down lightly so it stays in place. Cover with plastic wrap and set aside for 1 hour for the flavors to mellow.